Accidents in a private parking lot are not subject to the same laws under Ontario’s Highway Traffic Act (HTA), as are accidents on public roads. Nevertheless, there are general rules for right-of-way in parking lots which should be followed in order to avoid accidents. Among the most important rules is that a driver must obey any traffic signs within the parking lot, and vehicles in a thoroughfare lane have the right-of-way over vehicles in secondary lanes or those exiting from a parking spot. There are some rules that apply equally in private parking lots and on public roadways. The first is that any accident resulting in injury to a person must be reported. Any accident that resulted in $2000 in combined damage to vehicles and/or property must also be reported to police. Further, in a parking lot, as on public roads, a driver may face criminal charges for actions such as drunk driving or leaving the scene of an accident. If you were involved in an accident in a parking lot, you should follow the same proper steps for reporting the accident as required on public roadways. Most importantly, first check whether anyone was injured and if so, call emergency services immediately. You must also exchange personal information with any other driver(s) involved in the accident, and if you struck and damaged an unoccupied parked car, you are obligated to leave a note detailing your personal information on the vehicle. It’s always a good idea to take a picture of the vehicles and any damage at the scene of the accident, as such photos can substantiate your account of the accident to your insurance company or in the event that you wish to make a claim for damages. As the HTA generally doesn’t apply on private property, private parking lot accidents are typically treated as ‘no fault’ collisions by police (excluding when criminal actions contributed to the accident). This means that each driver is responsible for making a claim against their own motor vehicle insurance policy. Be aware that vehicle insurance policies generally require policyholders to report all collisions. However, if you and the other driver choose not to report the accident and decide to personally pay for any damage, each driver will be responsible for paying for the damage to their own vehicle. You cannot force another driver to pay for the damage to your vehicle in a parking lot accident (unless you report the incident to your insurance company and they seek reimbursement from the other driver’s insurance company). Also be aware, if the other driver decides to report the collision to his insurer (and you did not do the same), your insurance company will be informed and if you are partly or wholly at fault for the accident, your rates may increase even if you already paid personally for the damage. Insurance companies follow their own Fault Determination Rules to assess which driver will be held at fault for a particular collision and to what percentage they are responsible. The insurance company’s assessment of your fault will impact whether your rates increase or are unaffected by the accident. If you sustained injuries as a result of a parking lot accident, you may be eligible for damages for any losses you incurred, such as lost income, rehabilitation expenses, and pain and suffering. Each situation is unique and will be assessed on its merits, so the best course of action is to consult with an experienced car accident lawyer to find out about the strength of your case. 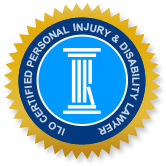 The Injury Lawyers of Ontario group are an affiliation of respected and knowledgeable personal injury lawyers with substantive experience in car accident claims, including parking lot accident claims. Call an ILO lawyer in your community to find out how we can help.